This is the kind of project I really like, making something that was definitely worn in the 1640s, but not widely reconstructed by re-enactors. Coats in my sphere of reenacting are usually short soldier’s garments or (if you are particularly flush), something called a casaque that has buttons on every seam so it can be worn as a cloak or a coat, or a dutch coat which is more often than no a shapeless longer version of the soldier’s coat with turned back, buttoned cuffs. A simpleplain coat feels like breaking new ground, though the long coat is something that has been worn from well before the ECW right up until nowadays, but this feels new to me and a fun project, not least because recently I have seen two original coats from the 17th century that inspired me to make something a bit different. There is also some documentary evidence that I have recently been shown. In the Aston papers that detail the equipping of a group of royalist mounted troops, cavalry and dragoons throughout the Civil War, there are several listed instances for long coats ordered from local tailors for the troopers with a detailed inventory and costing for each item used in the making. 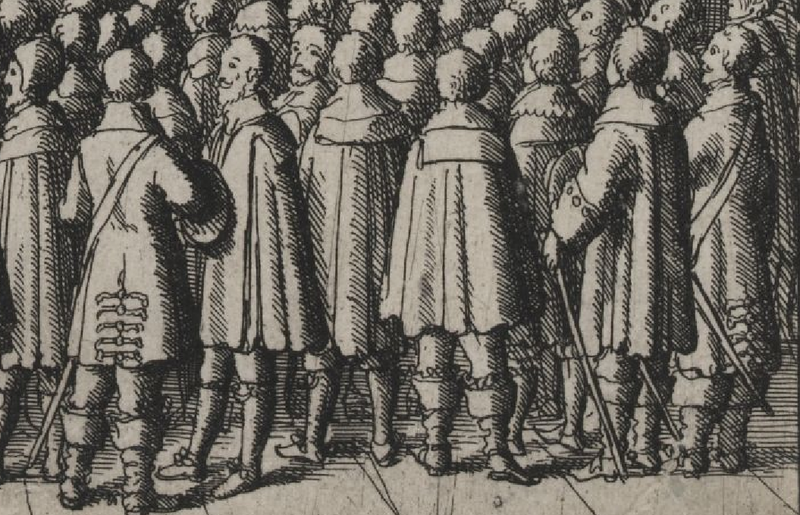 These coats were unlined, presumably because they were to be worn over other garments, doublets, shorter (jump) coats that were often ordered for the same mnamed individuals, frequently at the same time. They generally require the same raw materials: two and a half to three yards of broadcloth, 4d-6d worth of silk, looplace, 18-24, (or in some cases 48) ‘big’ buttons, one long button for each coat and lots of thread. It’s interesting to speculate on some of these items. What exactly did the tailor mean by a long button?, Where was the looplace placed? What did they do with the silk? I shall look at some of these things as I go on, but the crucial thing for me was the amount of fabric used and the number of buttons. I could draft a pattern using this that would not be very far from the coats they had. Firstly I went to two original coats from the 17th century and had a good look at the construction. Sadly I’m not allowed to post the detailed photos that I took, but suffice to say these are very interesting garments and cast a strong light on what a long coat may have been in the 1640s. The Colchester Castle museum has an undated coat that was found in a chimney in the Essex town of Maldon back during the second world war. 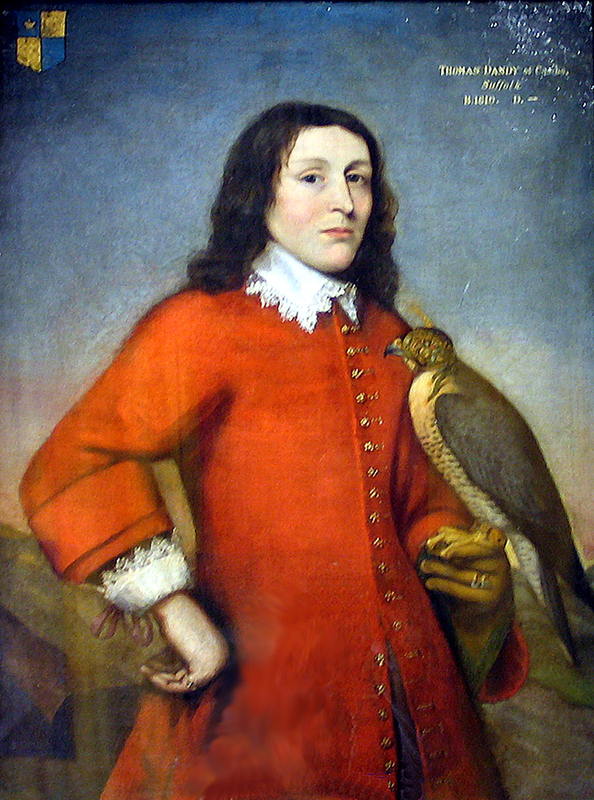 It’s not reliably dated to the 1640s, but the style of the coat is pretty close the things they wear in pictures from the 1640s and the way it is put together (stitching and pattern) are worth considering. 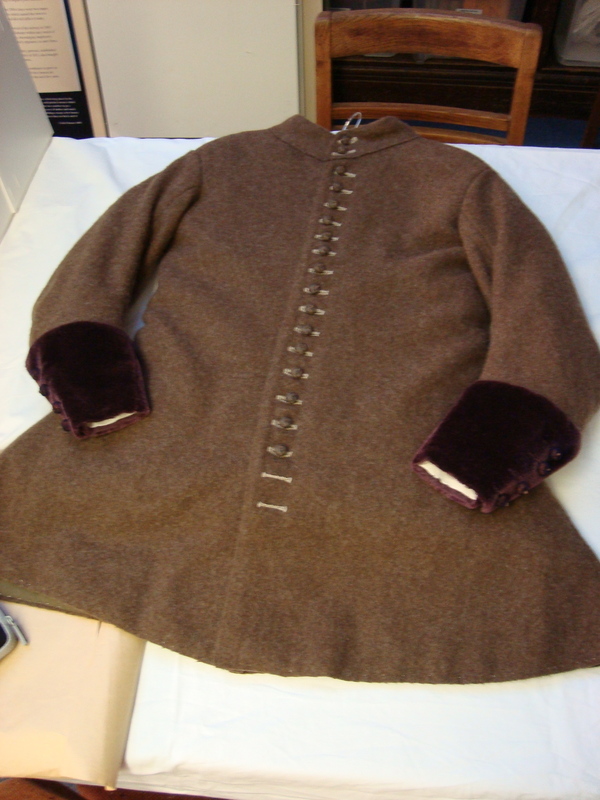 Here’s a photo of a replica made by Kate Gill for the museum, and a link to an article about Kate’s work on the coat with some photos. The second coat is in the V&A collection and is much more securely dated to between 1630 and 1650, but is of a similar style to the Maldon coat, though the detailed construction is different in a few details which I will go into in later postings. I also have several pictures that show long coats being worn that helped me draw up the pattern, the one at the top of Thomas Dandy of Coombs in Suffolk from 1650 is nice, but particularly this one (here left) that shows the back of two long coats (left and right hand side) being worn at the trial of Archbishop Laud. I like it particularly because it gives a clue of how a basic coat like this might hang when worn. Note that the swords hang over the top, unlike later coats, (particularly 18th century frock coats) that has open side vents that would allow the sword to poke out from underneath. This is significant.